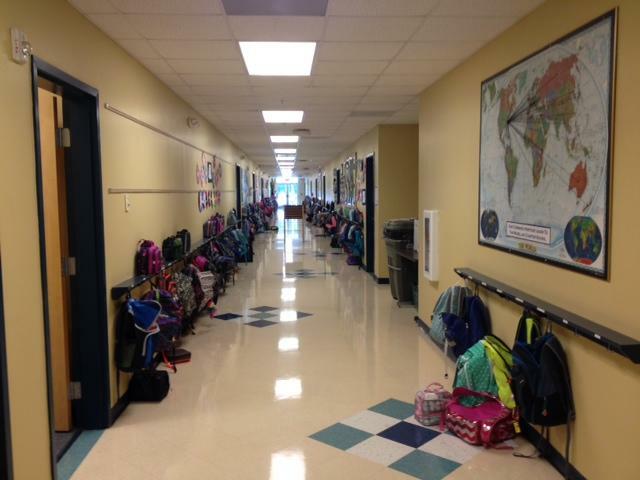 The elementary school hallway of Magellan Charter School. Magellan has one of the highest school performance grades in the state, but it also has a relatively wealthy student population. Jess Clark visits a high-performing charter school in Raleigh, where less than 1 percent of the student population is low-income. "What do you think that is?" she asks the students who gathered around the mysterious find. "A mushroom!" several answer in unison. "We just started 'living things,' so we're out doing field notes on what we can observe," Dail explained. Magellan has earned an 'A' every year since the state began giving schools letter grades in 2014. Its home is a three-story brick building nestled in a woodsy, upper-income neighborhood in North Raleigh. Magellan has an emphasis on experiential, hands-on learning that school leaders say brings the state standards to life, and in turn boosts test scores. Successful schools need all the right elements, and there are a lot of them—good teachers, an engaging curriculum, high-quality facilities and resources, and students who come to school ready to learn. Having all of these elements is rare. But by many accounts, Magellan has managed to get everything going for it. As a charter, Magellan is a public school and gets state and local funding, but it operates outside many of the bounds of the traditional public school system. The school serves grades 3 though 8, and opened in 1997 as one of the first charter schools in the state. Magellan's classes are small in size, and lengthy in time. Some of Magellan's learning blocks are almost two-and-a-half hours long. They teach only the four core subjects: English language arts, math, science and social studies. The class sizes are smaller than in most traditional public schools, according to the school's top administrator, Mary Griffin. "We try not to go any higher than 19 [students] in math. But for the most part, it’s 16, 17 students in the class," she said. And while school districts across the state are scrambling to fill teacher vacancies, teacher turnover is low at Magellan, and the positions are coveted. Griffin said she interviews around 20 applicants for a single open teaching position. 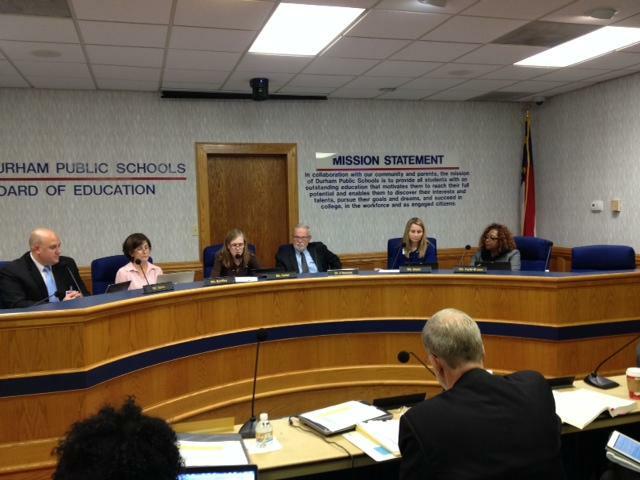 Magellan pays teachers significantly more than Wake County Schools. But Griffin said it's not the pay that draws them here, as much as the environment. "Just treating them as professionals," Griffin said. "Our teachers leave campus to go to lunch if they need to, or go to the bank so they can feel they’re in the workforce with the rest of the world." 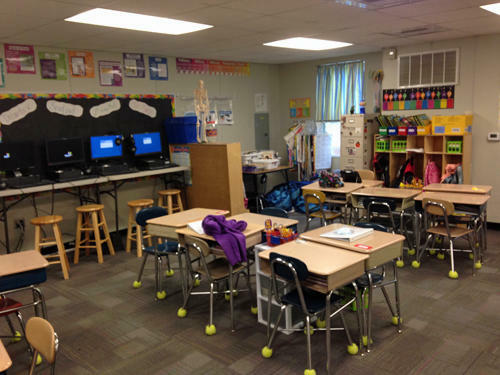 The school also spends a large portion of its budget on supplies so that teachers can do project-based learning without any out-of-pocket expenses. Effective teachers, small class sizes, project-based learning—these are all things that are likely boosting Magellan’s student performance. But there is another thing: Magellan's low-income student population is less than 1 percent—0.99 percent to be exact, according to data the school reported last school year to the state. Meanwhile, the average North Carolina public school is more than half low-income kids. 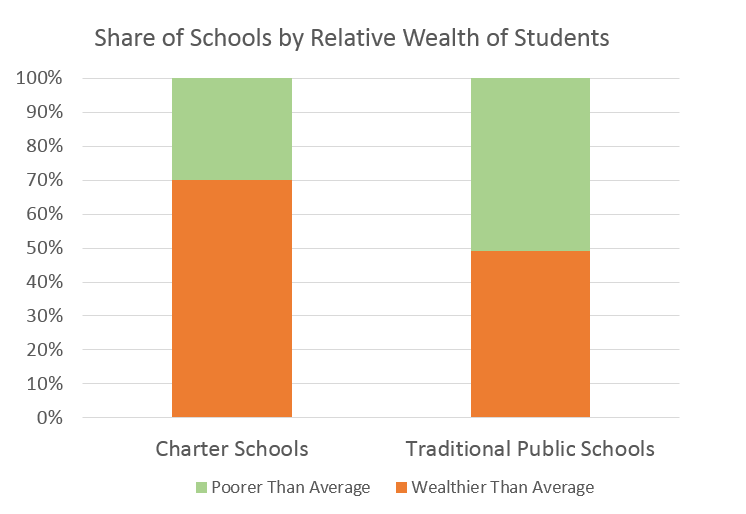 On the whole, student performance is generally higher at wealthier schools. Low-income students and their families often face greater challenges: food insecurity, unsolved health issues, high stress, and housing, transportation and logistical issues. Still, Griffin said just because students come from wealthier families, doesn't mean they don't face challenges. "Not necessarily economic challenges, but learning challenges, broken homes---things like that," she explained. Magellan isn't the only charter school that has extremely low numbers of low-income students. There are eight charter schools that reported having no low-income students at all last year. And more than two-thirds of North Carolina charter schools have smaller than average low-income populations. This chart shows the share of schools that have wealthier and poorer than average student bodies. The average North Carolina public school is 57 percent low income. Magellan hasn't made a concerted effort to attract a more socio-economically diverse student population. But Griffin noted the size and demographics of the existing applicant pool make that difficult. More than 1,000 students a year enter the school’s enrollment lottery for just 70 spots, and half of those are reserved for the siblings of current students. "The difficulty becomes getting enough diversity in the applicant pool to then increase the diversity of the entire population," she said. What that means is Magellan would have to get hundreds of low-income families to enter the lottery for there to be any change in the student body. That seems unlikely, since unlike traditional public schools and many other charter schools, Magellan doesn't provide lunch or transportation. That, the curriculum, the small class sizes and the top-notch teaching staff mean Magellan will probably be getting 'A's on the school grading system for years to come.